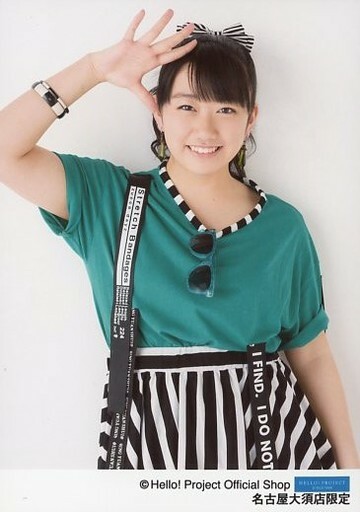 She is the best thing in H!P since ages... and they are doing nothing with her!! NOTHING! It pains me. She has cool Aya Ueto style boyish looks, massive abs and a really unique distinct voice... there must be some way they can inculde her in some unit or show, or whatever!! I hope there's some news about her soon. Usually when they go silent about eggs for a while, you can assume they're out. I'd hate for that to be the case here. At this time, Kitahara Sayaka, Satou Ayano, Sekine Azusa, and Arai Manami have completed their Hello! Project Egg training. Announcements on her future activities will be made as soon as they are known. Regarding Satou Ayano, Sekine Azusa, and Arai Manami, it has been decided that they will be participating in an event and TV show. ＊K-POP Dance Cover Event "DREAM ON! vol. 2"
"Up-Front Girls" (temporary title) starting April 2 on SkyPerfect TV. Featuring Sengoku Minami, Furukawa Konatsu, Mori Saki, Satou Ayano, Sekine Azusa, and Arai Manami. *I believe this is the branch of UFG that handled T-Pistonz+KMC, or may be Up-Front Style/Happy Style, judging from the company website. It's looking more and more like the current Egg roster is only the girls who were on stage at this year's Winter H!P Concerts. It'll be the ending song for the anime "Inazuma Eleven Go" on TV Tokyo starting May 4th. What's this I hear about a solo debut? So, it seems it will be released on June 22nd, it will be used for the ending theme for Inazuma Eleven GO!, and Yossie will be in the PV. It's got kind of a retro sound to it, huh? I guess they fixed her bad teeth, huh? Sooo weird to see her so princess-y. My favourite scenes in the PV are the ones with Yossi, and not just because Yossi is there... Because Sayaka has a simple, sporty style in them I'LL GET BRAINWASHED BY HER NEW IMAGE EVENTUALLY, SURELY. - The teeth were a bit of a charm point, but I guess staight teeth aren't bad either. - Eyes look huge sometimes, I quite like it haha. - That song is horrible. I don't like it at all. Like Shi said, maybe some rock would've suited her voice better. - The strange mix between princess and sporty... It's like just because she's from Milky Way, they're trying to make her fill a bit of a gap Koharu left behind. That dance is pretty uninspired as well... She is the sporty type, so I think she could've handled more challenging choreography. So yeah, pretty big anticlimax for me of course I wish her all the best, but they could've done so much better. 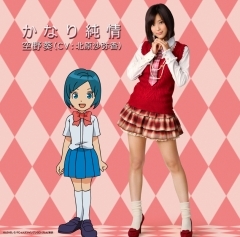 Kitahara Sayaka's solo debut is as Sorano Aoi, the character she voices in the anime Inazuma Eleven GO. 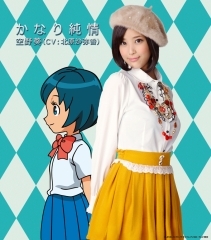 Yappa Seishun is the ending theme for Inazuma Eleven GO. "Kirari & Noeru appear! Their true colors revealed?!" Not too much of a stretch to say that it probably means that Sayaka will be guest appearing on the show! Looking forward to the screenshots and/or video later today! Oh, her site also says she'll be appearing at a Tower Records on the 22nd, and some live event thingies with her fellow agency members T-Pistonz＋KMC on the 24th and 26th. On September 7th, Former Hello! Project Egg and Up Front soloist Kitahara Sayaka announced her second single, “Kanari Junjou”, a single that is scheduled for release on November 9th. This upcoming single has already been revealed to be the new ending theme song for TV Tokyo anime “Inazuma Eleven GO” and its anime sized version has already been released through music distribution site Recochoku. “Kanari Junjou” will also be released in two versions – Limited Edition and Regular Edition. The limited version will include not only a CD but a DVD as well and the regular edition will enclose a promotion card for “Inazuma Eleven GO” card game in addition to the CD. Update in the form of pictures!! I think she looks lovely! 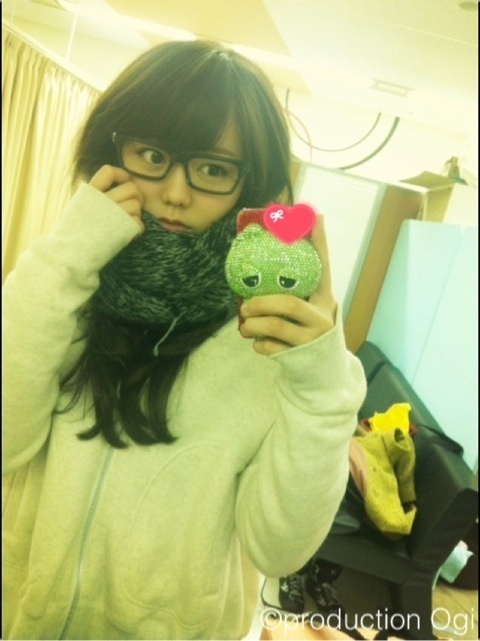 She reminds me of IU. Awesome Indeed!!! UpfrontEntertainment has uploaded her new single on YouTube. 空野葵　Blue Sky　to be released on November 9, the song is the ending theme of "Inazuma 11 Go"
This is INFINITELY better than her first one! Page created in 0.396 seconds with 18 queries.